The Australian Dollar is the national currency of Australia. It is known for its acronym AUD. This currency has been in use by Australia since February 14, 1966. Prior to that, the currency in Australia is the Australian pound. Within Australia, the $ symbol is used to refer to their currency. But for international foreign exchange market, A$ or AU$ is used in order to distinguish it from other forms of dollar currencies in use. In 2011, the Australian Dollar ranked fifth in the world in terms of the most traded currencies. The other currencies that were included in the list were US Dollars, Euro, Pound Sterling, and the Japanese Yen. In terms of the foreign exchange market, the Australian Dollar is highly favored by traders. This is due to the high interest rate for this currency and the minimal government control when it comes to currency trading. Meanwhile, the stability of the Australian political and economic system also contribute to making it one of the strongest currencies in the world. Since 1966, the coins available for this currency were in the following denominations: 1 cent, 2 cents, 5 cents, 10 cents, 20 cents, and 50 cents. In 1984, the one-dollar coin was introduced. Four years later, the two-dollar coin was introduced into the circulation. And starting 1991, the one- and two-cent coins were no longer issued and circulated in the market. Any cash sales or transactions were rounded off to five cents. The Royal Australian Mint in Canberra is responsible for minting the coins of the Australian Dollar. All coins have the image of Queen Elizabeth II on the back. As for the bank notes, there were two series released into circulation. The first series was issued in 1966. They were designed with the same denominations as the pound banknotes before the Australian Dollar was officially in use. Each of the bank notes vary in size too, which will depend on the value. In 1988, the polymer banknotes were issued by the Reserve Bank of Australia. This was done to commemorate 200 years of European settlement in Australia. Since then, all bank notes of the Australian Dollar are now made of polymer. In doing so, they become the first country in the world to do that. The use of this type of material also protects the currency from counterfeiting activities. 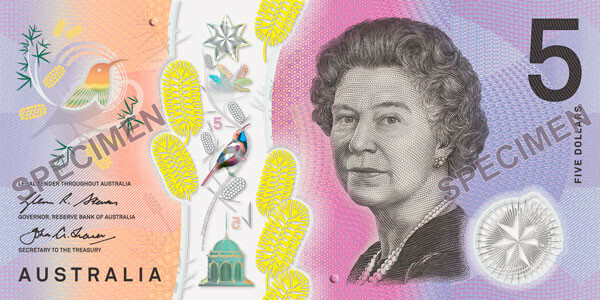 The colorful banknotes of the Australian Dollar depict famous Australians from the past and present. Some of them include Dame Nellie Melba, Edith Cowan, Reverend John Flynn, Mary Reibey, AB ‘Banjo’ Paterson, and Dame Mary Gilmore. Bringing other currencies in and out of Australia is not restricted. However, tourists arriving in Australia carrying more than AUD$10,000 in cash should declare it to the customs personnel at the airport. Australia is one of those countries to offer Tourist Refund Scheme facilities. 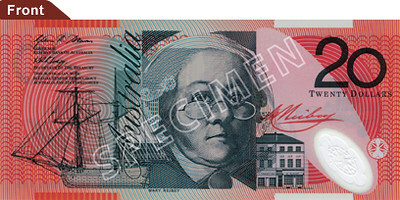 Note Printing Australia is responsible for printing banknotes for the Australia Dollar. Meanwhile, the coins are minted through Royal Australian Mint. There is a fine of $10,000 or 2 years in prison for offenses that include destroying the bank notes or coins.